A few of the artists around the studio joke around about ‘cheesing’ on one another. Artists are influenced by their experiences, and part of that experience is the work of other artists. We can’t help being influenced by one another. All the great movements in art were picked up and stretched by an informal collaborative of artists playing with similar ideas, building on one another’s work. Seeing other’s art helps me to see more clearly the possibilities for my own work — even if the style or the medium is completely different from mine. I recently attended a surfaces workshop with Adero Willard at Mudflat Studio. She is completing the Salad Days Artist Residency at Watershed Center for the Ceramic Arts. After these workshops, the shelves are invariably filled with riffs on the visiting artist’s work. You can walk by the shelves and say to yourself, ‘Looks like XYZ artist has been in town!’. Sometimes to integrate a technique or idea, we must first try it out the way we saw it before we can make it our own. This piece is my ‘Adero’ piece. Those familiar with her work will recognize the influence, although the form itself is not an Adero-style form. 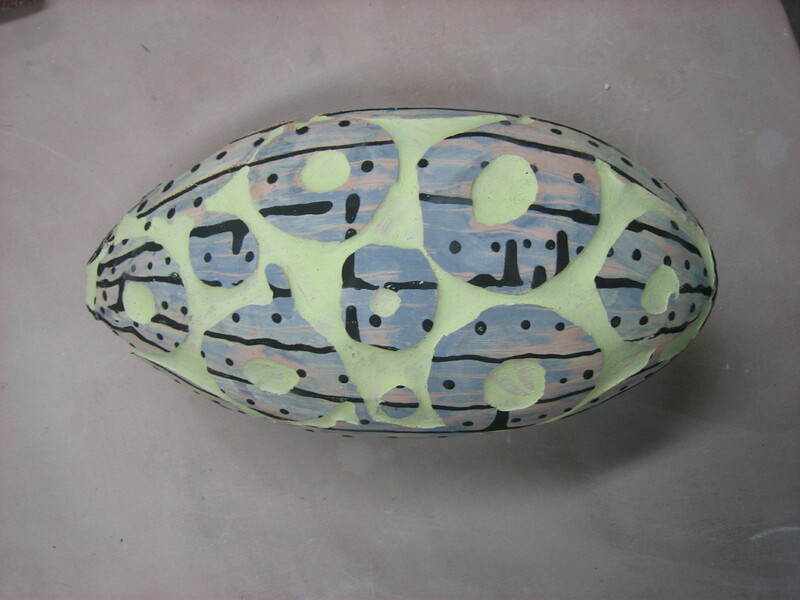 So Adero, if you’re reading this — here is my homage piece to you, as yet unglazed. Check back here for the result, and thanks for a great workshop. If you want to see some authentic pieces from Adero Willard, as only she can do them, go to www.watershedceramics.org. Or better yet, go to the Salad Days benefit and take one home with you! This entry was posted on March 3, 2008 at 4:57 am and is filed under clay, inspiration, possibilities, process, Uncategorized. You can follow any responses to this entry through the RSS 2.0 feed. You can leave a response, or trackback from your own site.